My name is Sigmund and I’m a capitalist. I believe in the Invisible Hand and all the dictates of supply and demand in the realm of MTG finance. This means I embrace all the positives – and inevitable negatives – of such a system. I’ve been hearing many disgruntled voices lately berating one body of people or another for their business practices. Wizards of the Coast is executing sets poorly by mismanaging print runs and introducing new “rarities” via Expeditions. Local game stores are unfairly price gouging on new products when they receive less supply than anticipated. Even Hasbro cannot escape the pitchforks, receiving blame for manipulating Wizards and poorly executing an online gaming platform. Everyone is entitled to their opinion, and I’m not going to sit here and decry that everyone needs to embrace capitalism as I have. But everyone should at least be aware of the underlying drivers that have gotten us into certain pricing situations. And if you take away nothing from this article but one thing, I hope that one thing is simply that there isn’t a single body to blame for certain pricing behaviors. Oh, and you may learn a thing or two about MTG economics along the way. Ready for another off-the-beaten-path type of finance column? Here we go! It’s possible to be a good-ole-fashioned capitalist and still think that WotC was incredibly short-sighted with their Fat Pack print run. It’s also possible to find SCG to be in the business of manipulating the market (with extreme ease). Those are, in fact, tried-and-true aspects of capitalism, especially with regards to supply-limited luxury goods with a production monopoly. Also, casuals and fat packs. I tell ya. I’d be happy to supply any of those players with a pack of 100 lands (all 25 arts) for $20. WOTC is still making the same profit on the fat packs regardless. So it’s not selfish ambition on their part. The LGS’s whose entire livelihood is selling cards, and who are the ones that keep WOTC selling product, and who give Magic players a place to play almost every day of the week… they stand to benefit from the fat packs current price. So the LGS is supported a little more than they were prior to the fat packs release… good for them. If people don’t like it? They can go invest tens of thousands of dollars themselves, and thousands of hours of sitting behind a counter, not playing, just facilitating… with no guarantee of any profit out the other end. Then, when the next BFZ fat pack opportunity comes around, they can cash in. I’m all for supporting the LGS. I spend a lot of money at mine. But this is a supply-side issue combined with a middleman inefficiency. And WotC bears primary responsibility for both. Perhaps it was by WotC’s design? It’s causing a lot of buzz/hype on their game, right? Let’s not forget everyone’s in this to make money. But LGS’s only make money if they sell something people want at a price people are willing to pay. If that’s $60, then that’s what they should charge. Creating buzz for a product that suddenly isn’t on the market is definitely not good business. I have no issue with WotC driving up sales by printing full-art basics. I do think it’s a problem when every LGS in the area can’t even get fat packs in to sell week 1. That’s bad business. They could *gasp* not buy fat packs! It’s not like they’re selling bread. These are magical pieces of cardboard, and stores should be allowed to charge whatever they want. If there are buyers, then that’s what the market is willing to support. Can SCG really manipulate a commoditized market? I can certainly see them manipulating the price of power, duals, and other cards with much less supply. But there are TONS of stores out there selling fat packs, likely many thousands or tens of thousands, so there’s no way they can “set the market” price unless they were supporting that price by purchasing all fat packs on the market under their listed price. They can demand a premium because they’re the world’s largest retailer for MTG – but that’s not manipulation. It’s smart business. It’s exactly like when people buy clothes at retail at the mall rather than shop around at TJ Maxx, Old Navy, Outlet Stores, internet, etc. They pay the premium for the experience. I wanted the 80 lands AND 9 lottery tickets. That’s what got me interested. 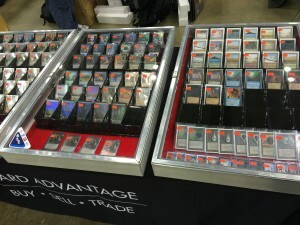 You wouldn’t sell 80 full art basics and 9 boosters for $40, would you? I believe this was simply an occasion of WotC failing to predict the level of demand. Given the markup for both them and the lgs’s, there’s no logical reason to not increase the supply of fat packs for a set like this. That doesn’t mean they don’t do a good job overall… Just in this specific instance. There’s not enough research, even in traditional markets, to determine to what extent a huge supplier can manipulate prices, especially with a product built around perception. SCG has very clearly manipulated high-elasticity prices before (as noted, duals). Whether they did it here or not, I’m not sure. And if they did affect the market dramatically, I’m not sure it was even intentional. And yes, name-brand effects of every type are obviously at play. That’s why SCG and CFB charge premium prices and I sell at tcgp low. As for selling 80 lands and 9 boosters for $40? In person I would absolutely do that. I’d do that with all 1,000 extra full arts I have sitting in a box. That’s my gold. I already sold the copper. I get the ‘capitalist’ view, but aren’t we 2015, a time where this simplistic view is outdated? One of the biggest issues with capitalism is that they don’t count the psychology of the people, and capitalists like to hide behind the supply/demand theory to make up for the manipulation they do on the market. The economy is shifting more and more to the ethical aspect of economy, and capitalists can no longer hide behind the inhuman theories. Yes, people pay that much, but they are manipulated to do so. People are ‘stupid’ because they lack the knowledge and should get protection against the manipulation. If not, I can read your pro capitalist statement as: if a kid is willing to sell his expedition for 8$, it’s OK, because he is happy with it, he can buy 2 more boosters. I know you don’t agree with that, and you probably have a rule to deviate for that rule, and then it’s where the line becomes more thin. food stores are known to make deals with other food stores to contain a high price for certain products. That’s OK for capitalism. But it’s pure manipulation. People will buy if they want it/need it. They lack the knowledge or the power to say no. And that’s why people are mad about SCG. Because they are known to ‘set the price’. A fat pack has this price now. and all shops follow. This has an higher effect than supply/demand. And that’s what people mean with gouging. They force a new price for the fat packs. Your theory is correct, but there more than supply / demand. You are not right because you make it simplistic. SCG doesn’t allow other shops to sell for lower. EVERY booster has at least 1 land. A box has 36 + 2-3 foils. Why isn’t the price of a boosterbox going up? If everyone starts selling them at 150$, than people will still buy them, because that’s the price. You do not understand either capitalism or supply and demand. Maybe you should give some more clarification, because otherwise, I’m feeling trolled. Capitalism encompasses private ownership of means of production and (in most cases) the free exchange of goods and services. It’s the most fundamental and successful basis for human transactions since history began. It also spans a huge swath of philosophies ranging from anarcho-capitalism to free-market capitalism to various flavors of regulated capitalism (what is practiced in most of the modern world). Mixed into that jumble are concepts like stocks, futures, etc., which actually have almost nothing to do with “capitalism” per se. Contrary to popular belief, capitalism isn’t even limited to free or mostly-free markets. Heck, the American Revolution was partially a result of closed-market, anti-competition nationalized capitalism. Yes, it’s a mess. But what you’re discussing isn’t capitalism. It’s either advertising (“manipulation”), single-source supply economics, or elasticicity of supply/demand principles. 1) “Manipulation” – Psychological manipulation falls in the category of actions with an ethical component, to which capitalism doesn’t speak. Capitalism does not address morality, only practicality (i.e. theft violates the principles of capitalism, so capitalism requires law enforcement of some sort). Whether it’s acceptable or not is really a moot issue – people are manipulable and this will be manipulated. It is no more relevant to discuss this here than it is to discuss people who spend beyond their means for MtG. 2) People being stupid – Technically, the average person (and the majority of persons) are of average intelligence, and are thus “stupid” from the perspective of some small percentage of humanity. But since you appear to be addressing information and wisdom, the more relevant point is that nobody living in the modern, western world has any excuse for not being informed. The poorest individuals have access to massive libraries and the internet. I have no sympathy for anyone who spends significant amounts of money on a luxury good without doing research. 3) Regarding SCG “gouging” – Here we actually get back to the topics of economics and capitalism. First, as far as capitalism is concerned, there is no issue. Supply and demand principles dictate that that prices will rise or fall until the supply equals the demand. That’s it. Now, the broader issue is the same one that applies to a huge portion of MTG – it is a single-source luxury good. There are some interesting principles with regards to how one treats singles versus boosters (boosters are a “raw material” and singles are a “finished product”) that parallel copper and gold mining… I make money on MTG using the same idea (break even on copper, cash in on the extraneous gold). That aside, total supply is a huge limiting factor for MtG. You can’t escape it. That’s why SCG (among many) is able to manipulate the market: WotC uses a business model that allows it. If you have an issue with it, that’s the level at which it needs to be addressed. 4) General concepts: In the end, this all comes down to the first rule of economics: something is worth what sometime else is willing to give you for it. People are willing to pay $70 for a fat pack, so that’s what it’s worth. Everything else discussed is simply an application of that principle. Ethics is a red herring. This is incredibly well written. I have nothing to build here – you covered it perfectly (better than I did, even). Is it incorrect to assume Target and Walmart will have more fat packs in particular than SCG? There are LOTS of Targets and Walmarts in the country. The fact that many people are finding these fat packs on shelves at $40-$45 suggests SCG doesn’t have enough of the market’s supply to “manipulate”. At least not at launch. 3 months from now it could look very different. thanks! that’s a lot more useful than the previous answer. And what I meant is indeed, emotional influence is very important here, and was not included in the capitalist theory above. No, you can’t read his “pro-capitalist” statement as that kid. That’s not “the market”, that’s “an individual”. You’re comparing apples and horses. Read my statement in the post above yours. 2) WOTC could just have easily said “screw it, no full art lands in fat packs”. Then NOBODY would have any chance at these at all… thanks guys! Were they to do #2 above, you could thank the idiotic socialist college professors and media-ites that whine about everything not being “fair” or “equal”. Emotions do tend to get in the way of economic theory. Most economic theory assumes everyone involved is rational and will make a decision that is best for their own personal gain (whether that be financial, emotional, etc.). But no one “has” to buy fat packs at $60…or at $6 for that matter. No one has to buy these pieces of cardboard at all. But they do – so they clearly want them even at a higher price. I don’t agree with the $8 Expedition anecdote either, and this is a good point you raise. Capitalism probably has to assume there’s perfect information available. If a kid is convinced to sell their Expedition at $8 the buyer is morally wrong, but the kid should also look up a value before agreeing to such a sale. Everyone has smart phones these days – even kids. Not sure we’re going to reach resolution to the debate here. But I love the dialogue and appreciate the comments! As a society, we have decided that children are not able to enter into contracts or certain transactions because they are, well, children. Trading an expedition for $8 is legally dubious – if it ever came up in court, the transaction could be rolled back. Adults are generally assumed to be responsible for themselves. If you want to be an adult and yet have the same protections as a child, you should expect to also be treated as a child. Great build, Alasdair. It’s easy to reach for a hyperbole to make a point but I do believe the example provided went too far to remain valid. And if a true capitalist feels an adult who trades away an Expedition at $8 deserves the consequence, then I say “trader beware”. I don’t trade in pork belly futures because I know nothing about the market. If someone knows nothing of Expeditions market, they shouldn’t deal in them. With internet everywhere, they should at least look up prices before making any deals. I’d say that depends on how you define “manipulate.” SCG observably influences the market with pricing decisions – sometimes directly or intentionally, as with the dual-land buyout of lore; sometimes indirectly or unintentionally, as other online vendors and many LGS’s pay a great deal of intention to SCG’s pricing and will gravitate towards it… sort of a stable equilibrium point/center of gravity for prices. But in this particular case, I think it was the latter, which would make it definitively NOT manipulation. As stated above, I think this was an issue of WotC simply not predicting the levels of popularity. My problem with the whole situation is that it results in a lot of very upset players (Casuals and Semi-Invisibles especially), bad rep for WotC and often LGS’s, and endless discussion about what’s actually a very simple situation. I work in a retail-parallel industry (DSD Vendor), as does my LGS owner, and what we’ve been hearing from employees is that those stores ALSO got cut on fat pack product, which is nearly unheard-of and raises a few questions all by itself. Overall, though, those stores actually get in a very limited supply relative to LGS’s, and they don’t do a lot of reorders (not that anyone can in this case). Moreover, they don’t shift from retail, so they’re essentially a non-player, as their supply can simply be bought out and relisted. The issue with this comparison is that fat packs are a single-run product. There literally are no more. Completely different situation. I would be interested in looking at how much online vendors can affect prices. I know that most players trade these days using stuff like TCGP mid (it’s what I use), and those prices are affected by CFB and SCG listings, so… hm. It would be an interesting topic. I’m also not certain if anyone has ever done a market analysis at any level regarding perceived price as affected by a major retailer. This indeed would be an interesting space to explore. I’m not sure if this site is the right venue for such a discussion. If only hobby finance was more mainstream, I swear some of this content would be publishable in an academic journal. Personally, I believe there’s enough product at Targets and Walmarts thus far so that PATIENT players can pay MSRP if they’d like. So in a way, fat packs sell for $60+ because players are lazy or impatient or both, and want product in hand immediately vs. visiting a couple Targets in hopes of finding them. I’m not saying that’s a bad strategy, just a tradeoff being made. Lastly, I like your point on SCG setting pricing trends, even if they aren’t manipulating. Many local shops simply use SCG pricing as their own (which I hate by the way). So if they charge more for fat packs, so do LGS’s, for better or worse. That, despite Targets and Walmarts selling for much less. I can get behind that relationship. It all boils down to what the main goal of anybody selling stuff it. Everyone ever making stuff always wants to sell out of stock, it means everything sold and you take away your max anticipated profit. Any additional production run will most likely not sell out, therefore taking away from potential profits. From a business standpoint, would WoTC willingly shoot themselves in the foot to make a relatively small percentage of the fanbase happy? Especially when it is over a product line that consistently leaves product on the shelf. Not purely on topic, but I also wanna bring up the fact that opening sealed product in this day and age is akin to gambling. The numbers all prove that if you want to play the game, the cheapest way to a complete and competitive deck is the secondary market. The gamer purists who think that every business selling them product is evil should, in theory, never be purchasing what is sold anyway. MTG, for me (and for many others, I would posit), is not merely gaming and financing (or even gamers vs. financiers). It’s gaming and financing and gambling (shamefully or not). There’s more of a thrill opening an Expedition than finding one online and shelling out money for it. The _experience_ of opening sealed product – the thrill – is built in to the cost of the product. The hype surrounding a product that is hard to find only makes the thrill of opening it that much greater. I, personally, am not going to shell out $75 for a Fat Pack. Especially when I can shell out $100 and get 36 hits of sweet sweet pack crack. If you hate the evil empire for “gouging,” then go to your LGS and buy each specific card you need for your deck and save a crap ton of money. Otherwise, let the invisible hand do it’s thing. Dave – I’ll have to disagree with you on that one. Buying sealed product is actually the best way to amass a collection if (a) you do it release week, (b) you have the up-front capital to purchase a sufficient quantity for resale (5 cases for a typical release will do it). I do believe there’s a gambling component to opening sealed product. But it’s factored into prices not as “emotional thrill” but as “EV”. The estimated value of 80 full art lands and 9 booster packs with inherent chances of scoring cards with some-such value is likely higher than the $40 of MSRP…certainly if you look at retail pricing that is the case. But generally I hate opening sealed product because luck is never on my side in these things. Only reason I did with fat pack is because it was a convenient way to get a nice variety of full art lands along with 9 chances at an expedition (which I didn’t open…nor did I open a single mythic). You’re telling me. I don’t open anything smaller than a box, and preferably a case, unless it’s pre-PT (while prices are all inflated). Until you’re opening at a mass level, there’s no statistical reliability. Gambling thrill, sure, that’s easily observable by watching a counter at an LGS for about 30 minutes. I’m not having trouble buying fat packs. I drive to Walmart and purchase one. What area are you in? All I’ve been hearing from the people I know is that they’re sold out across the board in Colorado, Wyoming, Utah, and most of Montana.